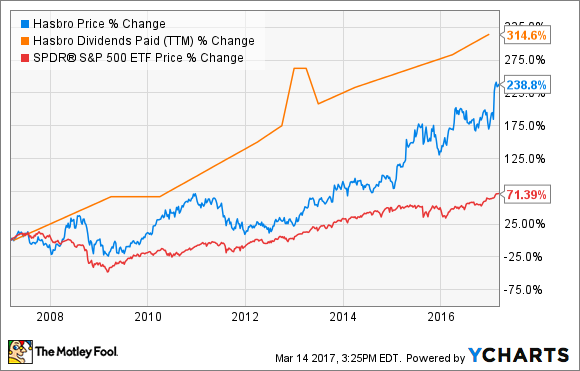 These two consumer brands offer investors a great combination of income and growth prospects. Investing for income and growth can seem like a contradiction, but many investors may not realize that it's very possible to blow away the S&P 500 Index's annual return while getting paid a little income along the way. Sound too good to be true? Well, it's true, and it's possible to do. Hasbro (NASDAQ:HAS) and Nike (NYSE:NKE), for instance, are two dominant companies with great brands, consistent histories of increasing their annual dividends, and good prospects for future growth. Let's take a look at both of these household names. Toys are a growth business. IMAGE SOURCE: PIXABAY. Worldwide revenue from toys and games is expected to grow 11% globally through 2020, providing a tailwind for Hasbro and other toy makers. Hasbro, Mattel, and privately owned LEGO are the dominant trio of the industry. Hasbro owns a big portfolio of iconic toy brands, including Play-Doh, Nerf, Transformers, and Monopoly. Hasbro also makes toys under Disney's Marvel and Star Wars franchise brands. The company has been very successful lately with its Disney and Dreamworks Animation partnerships. The new line of Disney Princess and Disney Frozen dolls, as well as Dreamworks' Trolls were well-received by customers in 2016 and helped Hasbro drive solid financial results. Revenue for 2016 increased 13% and crossed the $5 billion level for the first time in company history. Revenue grew 11% in the fourth quarter, and the toy maker saw very balanced growth across its North America, international, and entertainment and licensing segments. Revenue in emerging markets increased 12%, excluding the effects of currency fluctuation. Operating income increased 14%, faster than revenue, reflecting great cost management while still investing for future growth. It was good enough for management to increase the dividend 12% to $0.57 per share, giving it a 2.3% yield on March 16's closing price. Over the last 10 years, Hasbro has distributed a total of $1.7 billion in dividends, or about 34% of its cumulative cash flow. 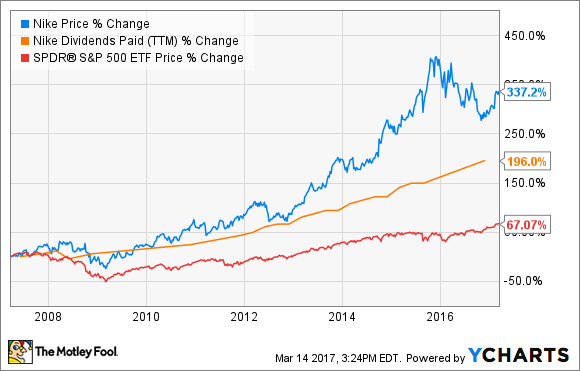 The dividend has notched a 14% compound annual growth rate over the last 10 years and has increased 13 out of the last 14 years. Hasbro is ready for another great year in 2017 with several movie releases, including Beauty and the Beast, Spider-Man: Homecoming, and Star Wars: The Last Jedi that will very likely drive higher toy sales for those respective franchises. The stock currently sells for a reasonable 20 times expected earnings and pays out an annual dividend yield over 2%. Nike's brand is a great competitive advantage. IMAGE SOURCE: PIXABAY. Nike is one of the most recognizable brands in the world, which is helping it squeeze more and more growth out of its most saturated market -- the U.S. The retail industry has been in a slump lately, but this is giving investors a great opportunity to take advantage of a lower valuation to buy a well-oiled machine like Nike. A few years ago, before the industry fell into a sales slump, Nike was growing North American sales at a double-digit rate. In the first six months of fiscal 2017, sales have slowed to 5% in its most saturated market. However, Nike's online business is booming, with 46% growth in the fiscal second quarter. Management continues to develop this channel as a solid contributor to the company's future growth. Nike is also developing a new store format that personalizes the shopping experience for customers. The company recently launched one of these new store formats in New York, showcasing what management believes is the future of retail. Nike Soho lets potential customers schedule an appointment with a "Nike+ Expert" for a one-on-one shopping experience. Being a global brand, Nike is very diversified across geographies. While North America is underperforming, Nike has picked up the slack with double-digit growth across Europe and in Greater China. In the first six months of fiscal 2017, Europe grew in the low double digits, and China grew 19%, excluding currency fluctuation. Overall, total revenue increased 9% in the first six months of fiscal 2017. Nike usually pays out around 30% of its annual earnings per share as dividends. Currently, the forward dividend yield on the stock is 1.2%, which represents a quarterly dividend of $0.16 per share. Over the last 10 years, Nike has grown its quarterly dividend about 13.5% per year. With a P/E ratio of 25 and the prospects for double-digit growth going forward, investors looking for a little income and global growth potential should consider Nike.